These run away with the leccy like anything, had one when I lived in a flat years ago. These run away with the leccy like anything, had one when I lived in a … These run away with the leccy like anything, had one when I lived in a flat years ago. Oil filled need to be on for ages before you get any benefit of them being on, fan heaters are instant heat which is handy to have on in the mornings while getting ready for work. 2KW fan heater costs about 18p an hour to run, if i remember rightly? So a 2KW oil filled will cost the same, only it will take a lot longer to get warm. Oil filled need to be on for ages before you get any benefit of them … Oil filled need to be on for ages before you get any benefit of them being on, fan heaters are instant heat which is handy to have on in the mornings while getting ready for work.2KW fan heater costs about 18p an hour to run, if i remember rightly?So a 2KW oil filled will cost the same, only it will take a lot longer to get warm. Will be more like 25p an hour based on unit prices I've found recently. Which would equate to £90/year @ 1 hour each day. Not a cheap way to heat your house!! I have one, and for quick heat, it's spot on. I am on night rate electricity, between 0030hrs and 0730hrs this heater costs about 7p per hour to run on full (2kW). since I have to be at work by 6am, a heater like this provides a fast, good roomful of heat safely on a timeswitch when I need it for a reasonable rate - certainly better than switching the central heating on - everyone else in my house is sensibly asleep when I get out of bed. Buy this and stick it in the footwell of your car, switch it on and connect to an extension lead. On a frosty morning five minutes before you need your car switch on the heater from the comfort of your house. No scraping and a nice warm car when you drag yourself outside! I am on night rate electricity, between 0030hrs and 0730hrs this heater … I am on night rate electricity, between 0030hrs and 0730hrs this heater costs about 7p per hour to run on full (2kW). since I have to be at work by 6am, a heater like this provides a fast, good roomful of heat safely on a timeswitch when I need it for a reasonable rate - certainly better than switching the central heating on - everyone else in my house is sensibly asleep when I get out of bed. A radiant halogen heater is still about a third of the cost of a fan heater - you could have that on a 400w setting for the same time as this and provide the same heating effect. think i might try cling film to insulate the windows to help conserve heat....anyone tried this? Would this be safe enough for camping? think i might try cling film to insulate the windows to help conserve … think i might try cling film to insulate the windows to help conserve heat....anyone tried this? I used B&Q's film insulation (not exactly cling film) last year and its quite effective, its a 2 man job to put it on the window but kept the drafts down. I was thinking of getting it again this year. I used B&Q's film insulation (not exactly cling film) last year and its … I used B&Q's film insulation (not exactly cling film) last year and its quite effective, its a 2 man job to put it on the window but kept the drafts down. I was thinking of getting it again this year. i cant find a cling film roll wide enough to cover the window in one pass. I know the idea is to create a tight seal but do you reckon 2 i could use to sheets taught and then tape in the middle and further taught (using hair dryer)...? I used the Wickes film insulation. Seems to be working quite well - I even put two large sheets of it over two entire large sash windows, which stops the draughts if nothing else - we hardly ever open them anyway. I wouldn't say it's a two man job - I did all the windows (including the two large sash windows) by myself. My method is to expose a little of the double sided sticky tape in the centre of each side of the window, so you end up with a couple of inches of exposed sticky tape at the N, S, E & W compass points. Then you stick the film to the N point, stretch it down to the S point, then E and W. Now the film is held in place you can expose the rest of the sticky tape and finish attaching the film one corner at a time, keeping the film well stretched. It should already be pretty well stretched if you use this method, so you won't need to heat it a lot with the hairdryer. Are you seriously going to use cling film? I really can't see that working, and even if it does I can't see it looking very good. I'd shell out a little bit more for something that's actually designed for the job. I've just come out of grimsby morrisons, can't see any heaters for a fiver. They have the halogen ones for 10 which is about standard, and oil filled for 25. On the clingfilm debate, which is perhaps off-topic, I have full upvc triple glazing in my house and its brilliant. Cost barely more than double glazing, too. A radiant halogen heater is still about a third of the cost of a fan … A radiant halogen heater is still about a third of the cost of a fan heater - you could have that on a 400w setting for the same time as this and provide the same heating effect. How can 400w be the same as a 2kw heat source? It is NOT more efficient. It is EXACTLY THE SAME efficiency as a fan heater or any other type of electric heater and therefore will cost ABSOLUTELY THE SAME AMOUNT TO RUN FOR A GIVEN HEAT OUTPUT. The only way you can cheat is to use storage heaters on Economy 7. Sorry to shout, but they don't seem to teach physics in school nowadays. That is completely wrong. You would only get 1/5th of the heating effect. It's called the law of conservation of energy. Where do you get a 2kW source of electricity in a tent? Buy this and stick it in the footwell of your car, switch it on and … Buy this and stick it in the footwell of your car, switch it on and connect to an extension lead. On a frosty morning five minutes before you need your car switch on the heater from the comfort of your house. No scraping and a nice warm car when you drag yourself outside! Fine, but a potential death trap with a bit of condensation around or a bit of melting snow or ice. Use of an extension leads which will be essential means there WILL be a connection outside the house too, so make sure that the plug and socket for that is kept INSIDE the car and not trailing outside on an icy (therefore DAMP) day. At the VERY least also run it through a plug-in RCD of the type used for garden electrical tools. How much wood would Lynn Faulds Wood fold if Lynn Faulds Wood would fold wood? 1) soooo bright - you can't watch tv with a halogen heater on - it's like having a massive lightbulb on in the room. 2) the halogen tubes, being like a lightbulb, tend to blow fairly quickly. a three tube-halogen heater becomes a two tube, then a one tube within a couple of years. oil filled heaters are far safer, but has been said, have a delayed effect when you switch them on whilst the oil heats up. that's not wasted heat though - you get it back when you turn the heater off and it stays warm for a while. How much wood would Lynn Faulds Wood fold if Lynn Faulds Wood would fold … How much wood would Lynn Faulds Wood fold if Lynn Faulds Wood would fold wood? Is that some sort of attempt at trolling? It is NOT more efficient. It is EXACTLY THE SAME efficiency as a fan … It is NOT more efficient. It is EXACTLY THE SAME efficiency as a fan heater or any other type of electric heater and therefore will cost ABSOLUTELY THE SAME AMOUNT TO RUN FOR A GIVEN HEAT OUTPUT. The only way you can cheat is to use storage heaters on Economy 7.Sorry to shout, but they don't seem to teach physics in school nowadays. Sorry - you have still failed to grasp basic physics. 1) The heat given out by the radiator while the element is off is exactly balanced by heat not given out while it is on. Yes, a fan heater stops producing heat instantly when switched off but an oil-filled radiator doesn't start producing heat instantly when it is switched on. 2) The thermostat cuts out because the heat can't escape into the room fast enough. Yes, it's only on half the time, but the result of that is you are only getting half the heat out. So, you are saving nothing by using an oil-filled radiator compared with a fan heater. If you are paying less in electricity it's because your room is colder. If the room is too hot when using a fan heater that's nothing to do with efficiencies, it's because the heater is too powerful for the room. Comparing what the thermostats do on the different heaters tells you nothing; the temperature of the room is the only thing that matters. Sorry to shatter your illusions. It's not rubbish. You're right in saying that the oil stays hot, but do achieve that the oil filled heater needs to be switched on for a period of time before you actually start to feel heat coming out of it. Let's say, 30 minutes. If you switch it off, the oil will continue to give out heat for about 30 minutes after the electricity is off. So the two cancel each other out... the "free" heat you get after you switch off the heater is actually paid for by the time you wait for it to heat up at the start. Sorry, but you can't cheat physics. Conversion from electricity to heat is almost 100% efficient, so whatever type of heater you buy the output is going to be more or less the same. OK, you do use up a small amount of energy powering the fan, but this is negligible compared to the energy used to provide the heat. Every time there's a thread about electric heaters, someone comes on with the myth that one sort of heater is more "efficient" than another. I find it so worrying the amount of money people must have wasted on heaters thinking that they are going to save money - all to the great delight of the manufacturers I'm sure. 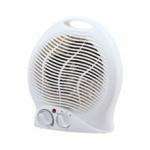 Yes, different types of heaters are more or less responsive. Yes, the heat is distributed differently which you can take advantage of. But no, you do not get more heat out of one sort of heater compared with another for a given power input (in other words, cost per hour). It's impossible. OK, you do use up a small amount of energy powering the fan, but this is … OK, you do use up a small amount of energy powering the fan, but this is negligible compared to the energy used to provide the heat. Actually, virtually all the energy powering the fan is simply converted to heat as well (via inefficiencies in the motor and friction in the air), so even that doesn't detract from the efficiency of a fan heater! lol...at the end of the day at a fiver its a bargain! That is completely wrong. You would only get 1/5th of the heating … That is completely wrong. You would only get 1/5th of the heating effect. It's called the law of conservation of energy. Not arguing about conservation of energy - any heating device is by definition 100% efficient at producing heat - but how that heat is felt is where this is different. If you have a 2kw fan heater blowing at your feet and a 400W halogen heater at your feet the net effect is the same - burnt feet! It's cheaper to burn your feet using halogen than with a fan heater - because a fan heater heats the air, which dissipates (until eventually the entire room is warm) but the halogen heats only whatever absorbs infra-red radiation in front of it, i.e., your feet. If you want to heat an entire room then there's no difference between the … If you want to heat an entire room then there's no difference between the two. If you just want to be warm in the mornings, go with halogen.